ORLANDO, Florida (CNN) -- Remains found last week in a wooded area have been identified as belonging to missing Florida toddler Caylee Anthony, authorities said Friday. 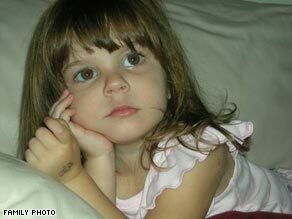 Caylee Anthony, 2, had been missing since June in a case that has received national attention. The cause of the child's death will be listed as homicide by undetermined means, said Jan Garavaglia, medical examiner for Orange County, Florida. She said she does not expect enough additional evidence to surface for that finding to be revised. The remains were identified through DNA testing, comparing a sample from the remains to a sample known to be from Caylee. Some of the remains had been sent to the FBI lab in Quantico, Virginia, for testing. The skull was found December 11 a half-mile from the home of Caylee's grandparents, where the girl and her mother, Casey Anthony, 22, lived before the girl disappeared. She was last seen in June. Orange County Sheriff's Capt. Angelo Nieves said Thursday that searchers at the site had found "significant skeletal remains" since the discovery of the skull. A "large percentage" of Caylee's skeleton has been recovered, Garavaglia said Friday. The bones showed no sign of trauma before death. Garavaglia said the manner of Caylee's death -- an opinion based on factors including an examination of the body and circumstantial evidence -- was determined to be homicide. Caylee's grandmother Cindy Anthony was notified of the test results by the medical examiner's office, Garavaglia said. Officials at the Orange County Corrections Department said Casey Anthony was notified of the results by a chaplain about 1:45 p.m., per jail policy. One of Casey Anthony's defense attorneys, Jose Garcia, entered the jail earlier, corrections officials said in a written statement. Watch Nancy Grace for the latest breaking news in the Caylee case. Tonight 8 & 10 ET on HLN. "Due to happenstance, not policy, attorney Garcia was not in the presence of the inmate when the notification was made," the statement said. "We will not be commenting on the demeanor of inmate Anthony or her reaction to the news." The Anthony family's pastor, Thomas Shane Stutzman of Eastside Baptist Church, arrived at the jail about 2 p.m. but left 19 minutes later because Casey Anthony had refused his visit, as she was meeting with Garcia at the time, jail officials said. Casey Anthony could face a sentence of life in prison if convicted. Prosecutors said this month that they will not seek the death penalty against her. Garavaglia would not disclose specific information regarding the remains other than to say they were completely "skeletonized." Toxicology tests on the remains are pending, she said. "Our number one priority from day one was to locate little Caylee Anthony," Orange County Sheriff Kevin Beary said. "We have stayed the course, and we will continue to do so until we have thoroughly completed our investigation into this tragedy." The sheriff grew emotional while responding to a reporter's question about the effect of the case on him personally. "Having a kid ... I've raised two girls, goodness gracious," Beary said, his voice breaking. "The bottom line is, no child should have to go through this." The case has left an "open wound" in the community, he said, but he thinks closure will not come until after trial. George and Cindy Anthony, Casey Anthony's parents, did not give up hope that Caylee was still alive until they were notified of the test results, their attorney, Brad Conway, said Friday. He took no questions but read from a statement. "They now know that their precious granddaughter is safe and hope that she will serve as the angel that protects thousands of missing children and their families," he said, adding that the Anthonys want "the same answers as everyone who has been assigned to investigate and prosecute this case" and will be available to authorities. "As you can imagine, the Anthonys are grieving deeply over this loss," he said. "Please respect their privacy and understand they will stand together as a family in order to get through this. ... This is a tragic moment in the lives of good and honorable people. Please treat them respectfully so they can grieve with dignity over the loss of this precious child, Caylee Marie Anthony." On Thursday, the sheriff's office said that the utility worker who found the skull December 11 had called police three times -- August 11, 12 and 13 -- regarding the site where the remains were found. That utility worker, Roy Kronk, came forward Friday. Reading from a statement, he said that "back in August of this year, I previously reported to Crimeline and to the sheriff's communications center that I had spotted something suspicious, a bag in the same area." "I have been and will continue to cooperate fully with the ongoing investigation by the sheriff's office and the FBI," Kronk said. His attorney, David Evans, said Kronk "has no connection whatsoever to this case, has no connection whatsoever to the Anthony family or any of the proceedings that have gone on before. He is here as a concerned citizen and no more. Those who have specified to the contrary could not be more wrong." Evans said Kronk was asking for privacy for his co-workers, who have been the subject of "intrusive news-gathering activities." Some of those colleagues, he said, "protected his privacy and sacrificed their own in doing so." Kronk will not be granting interviews at this time, Evans said. Police said Thursday that in his first call August 11, the worker reported seeing a gray bag on the side of the road. A deputy responded, Nieves said, but the worker was no longer at the scene, and the deputy did not see the bag. On August 12, the worker called a police crime line. The call was sent to a detective, who told the meter reader that the area had been searched and cleared by cadaver dogs, police said. On August 13, the worker reported finding a bag in a swampy area, and a deputy was dispatched. The deputy looked at the area but found nothing, thinking the "bag" may have just been trash, Nieves said. The meter reader revisited the site last week, apparently while working in the area, authorities said, and found the skull. The site was searched earlier, Beary said, but was flooded at the time. Nieves said Thursday that police were conducting a thorough review of the tips and their response but emphasized that the meter reader has been cooperative and is not a suspect. Beary acknowledged Friday that there were questions surrounding those tips but said the only way to find the answers was to conduct an investigation. CNN's John Couwels and Natisha Lance contributed to this report.